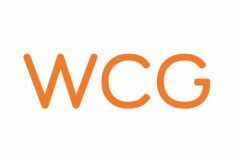 This page shows the latest WCG news and features for those working in and with pharma, biotech and healthcare. WCG has been named Global Healthcare Agency of the Year by The Holmes Report. ... WCG opened its own London office in 2008, and has more than doubled its staff numbers there in the last six months. WCG has made four new senior level hires in its London office to expand its team to 15. ... Cohen said: "WCG has made significant investments to build our international presence and capabilities. Global healthcare agency WeissComm Group (WCG) has strengthened its UK team with two senior appointments. ... Healey joins from Chandler Chicco Companies (CCC), Gerber joins WCG from MS&L. And companies WCG and Nature Publishing are delivering education and information in a manner that can be syndicated across all platforms relevant to audiences, to meet real educational and informational need. ... The Author. Zoe Healey PhD, director WCG. She has held senior leadership roles at several medical education agencies, including The Medicine Group, Ogilvy 4D and Ogilvy Healthworld, WCG and most recently at Ashley Communications. agency of the future', said Jim Weiss, founder of WCG's parent group W2O. ... Established more than a decade ago, WCG serves clients through offices in San Francisco, New York, Austin, Los Angeles and London. Watch our WCG video to learn more about the people behind the company, our key guiding principles and our outstanding growth in the last three years. PRWeek Agency Rankings:2017 Finalist, Mid-sized consultancy of the year . 2012 WCG Ranked #12 in UK Healthcare League Table. ... 2012 WCG Ranked #87 and singled out as ‘one to watch' in UK Top 150 PR Consultancies.